The scientists were able to concentrate light down to less than a billionth of a meter. 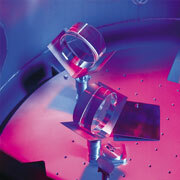 Cavity optomechanics is the study of how light interacts with material objects. Researchers in this field aim to discover the fundamental effects of quantum theory and gravity – while experiments in the field usually involve the use of lasers and mirrors, and how they change certain properties of each other. In a study conducted by the University of Cambridge, scientists were able to take advantage of some peculiar properties of gold to focus light down to atomic levels, allowing scientists to see individual bonds between atoms. The research team used highly conductive gold nanoparticles to create tiny optical cavities, called ‘pico-cavities.’ These pico-cavities are essentially bumps in the gold nanostructure that are so small, that only a single molecule can fit inside. Using these optical cavities, the scientists were able to concentrate light down to less than a billionth of a meter. The cavities were made using a laser that prompted the gold atom move in real time. The material was a challenge to make according to the researchers, since the pico-cavities needed to be stabilized in cryogenic temperatures to prevent the gold atoms from moving around. “Even single gold atoms behave just like tiny metallic ball bearings in our experiments, with conducting electrons roaming around, which is very different from their quantum life where electrons are bound to their nucleus,” says Professor Jeremy Baumberg, a researcher from the NanoPhotonics Centre at Cambridge’s Cavendish Laboratory who lead the study. This research could show us new ways to study how light interacts with matter. This includes the exploration of the possibility of manipulating molecules in the cavity to undergo chemical reactions, thus paving the way for a new field of light-catalyzed chemical reactions. Further, this technique could be used in a new kind of storage device where information is written and read through light and stored in the form of molecular vibrations.